Last year about this time, we detailed a turf-to-bed conversion in the front yard of our rent house in the downtown Lavaca neighborhood of San Antonio. We thought it would be helpful to share what happened over the past year on that small square of yard, thoughtfully converted from a drought damaged lawn to a mostly native butterfly garden with a bit of edible landscape thrown in. The garden is located in Southtown, near downtown San Antonio. What follows is a month-by month lowdown of a Year in the Life of an Urban Butterfly Garden. Hopefully you’ll be inspired to get busy and start your own. It actually started in November of 2011. At the time, work and personal circumstances pulled me back to San Antonio after 12 months of temporary duty in Austin. I joined my husband at a distinctive green-built downtown “Cube,” one of a pair of rentals conceived by progressive architect/urban pioneer Hilary Scruggs of Operative Ventures. Our plan was to live there one year while building a house on a nearby empty lot just a mile away on the border of the historic King William district. We’re now well into Year Two of that plan. The Cube’s front yard St. Augustine was badly burnt from months of 2011’s historic drought. Scruggs agreed to let me have my way with part of the yard, planting it as a butterfly garden and edible landscape. Because I become irrationally attached to certain plants, I choose to recycle them, digging them up from one yard and moving them to another. The prior year, upon moving from our large family home in Alamo Heights to Austin, I took along several beloved favorites from my well-established butterfly garden–a large rue bush, several milkweeds, reliable red and mealy blue sages, and a couple of bulbines. These same plants, and a few new ones, made the 75-mile trek to Austin and were now returning with me. In December, we prepped the area via solarization, using mulch and newspaper to kill the turf. Six-10 layers of newsprint or cardboard covered by three-four inches of mulch and steady South Texas sunshine will typically kill grass and weeds in just a few weeks, creating a decent environment for transplants, which we installed right away. Then, we waited. One of the mainstays of my urban butterfly gardens has been various types of daisies, all members of the Helianthus family. I love dramatic sunflowers in early spring and have a fondness for Cowpen Daisy, because it blooms from March to November and takes our Texas heat so well with little water. Last year I planted daisy, sunflower and milkweed seeds indoors in February. The milkweed would be used for “caterpillar food,” when Monarchs started arriving in March. By the time of our last official estimated freeze date, March 15, Mammoth Sunflower and Cowpen Daisies started indoors were transplanted to the front yard. Our transplanted milkweeds were already hosting dozens of migrating Monarchs, who graced us with eggs which we gladly brought inside for fostering. The hungry critters devoured sprouts of Tropical mlikweed we had planted in pots specifically for their consumption. We also installed a few tomato, okra and pepper plants, and of course parsley, rue, and fennel, which double as Swallowtail host plant as well as culinary herbs. garden vandals saw fit to decapitate our sunny soldiers, leaving their seed heads drooping in the breeze. In one case, a 12-foot tall sunflower was beheaded by a teen walking past. A worker installing a fence for a neighbor called her out. The girl dropped the sunflower head and another passing teen lay it on our front porch. Such are the travails of the unfenced urban garden on a well-trafficked sidewalk. May brought the first tomatoes and a couple of okra. Cowpen Daisies flushed their yellow blossoms, drawing Bordered Patch butterflies, which use them as a host plant. By now, Swallowtail butterflies regularly visited the garden, nectaring on the prolific daisies and leaving their lovely, round eggs on our fennel and my well-traveled rue. The Swallowtail caterpillars are highly entertaining, and sport crazy yellow tentacles that seem to reach out and fathom the universe when bothered, giving off a weird scent. Kids love them. The sunflowers were losing their charm as the weight of their heavy heads caused them to slouch forward in sad fashion. Sparrows and cardinals started perching on their stiff stems, pecking the protein-rich seeds. 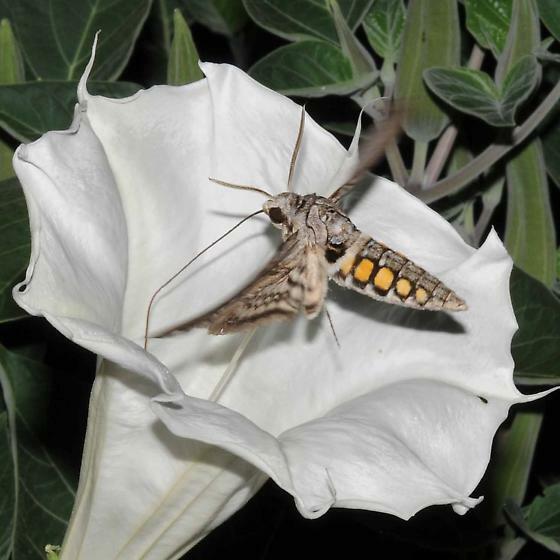 Tomato and Jimsonweed plants became common hosts for Tomato and Tobacco hornworms, which later morph into the beautiful Sphinx moth. Loathed by gardeners, I find these caterpillars charming with their eight V-shaped marks on each side and a signature horn on the rear. Manduca sexta, the tobacco hornworm, closely resembles its tomato preferring cousin, but shows seven diagonal white lines on its sides and a curved horn. Because they are moths, the caterpillars drop to the ground, cover themselves with earth to later rise as a large, hovering night-flyer. Fourth of July brings peak summer–long, hot days. Daisies, milkweed, Jimsonweed and sages are taking the heat well. Sunflower seeds are ready for collection from their tired, dried heads–here’s how to harvest them. We also had our first brood of Bordered Patch butterfly caterpillars on our Cowpen Daisies. The fuzzy black critters decimated a few leaves, but the birds soon came and made quick snacks of most of them. We start to see Queens in late summer. Queens, Danaus gillippus, share the multiple charms of Monarchs, Danaus plexippus. Both flaunt large size, flashy, striped caterpillars, and chrysalises that resemble a jade crystal, flecked with gold. If you have flowers blooming during the most brutal summer days, you’re likely to see the burnt orange creatures. Like Monarchs, Queens lay their eggs only on milkweed, but they nectar indiscriminately. Males have a penchant for Gregg’s purple mist flower. Apparently they extract minerals necessary for their virility from the native perennial. Late August and early September signal the start of the Monarch migration in our part of the world. We usually buy our tags from Monarch Watch in August and tag the first Monarchs over Labor Day weekend. Monarch Watch has run the citizen scientist tagging program for more than 20 years. Hundreds of thousands of butterflies have been tagged in the two decades by nature lovers like you and me. The data collected by those citizen scientists has helped piece together the many mysteries of the Monarch migration. We’ve tagged about 2,000 over the years and had 26 recoveries from the forest floor in Michoacan. 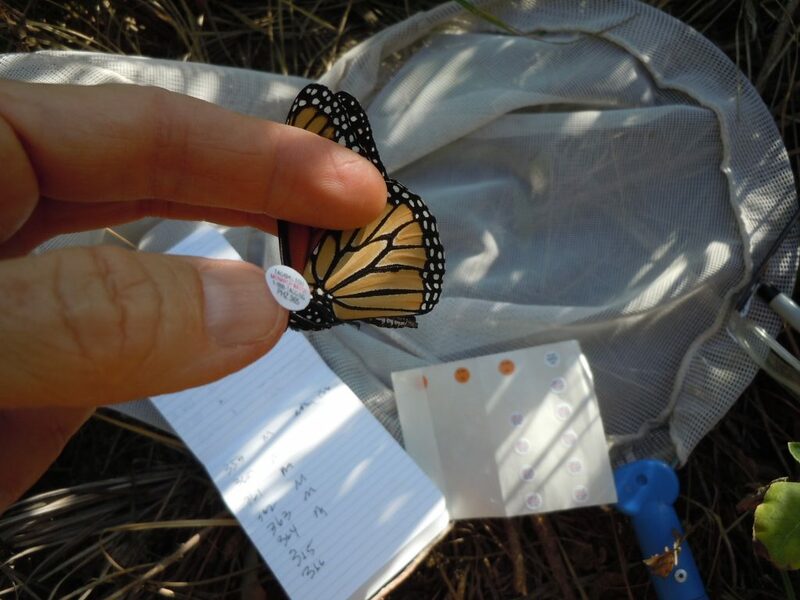 Here’s how to tag Monarch butterflies, if you’re interested. April and October are always some of the best months in the garden in South Texas. If you’re lucky and plan ahead, you can still be pulling okra off your plants, get a second round of tomatoes and harvest some peppers. Perhaps now you can see why I love the Cowpen Daisy so much. The plant just keeps on giving blooms. The more you cut it back, the more it puts out. You can shape it into a hedge, let it grow tall and gangly, or chop it short and bushy. And of course the butterflies love it. Butterflies and other pollinators are ubiquitous this time of year because the weather is so perfect for blooms. November is a great time to collect seeds for next year’s butterfly garden. It’s prime time for planting many native wildflowers, too. Some dislike the brown woody look of native annuals that must be allowed to “go to seed” in order to produce blooms next year. But for me, the seeds add to the charm of these reliable plants. And while you’re gathering those seeds, the butterflies just keep on coming. Our typical first freeze in San Antonio is supposed to be in mid-late November, but climate change has made that so unpredictable that we, like the birds, butterflies, bats and bees, should seize every sunny, warm day and make the most of it. The last month of the year is a good time to make use of those seeds you’ve collected. Brush them off the sidewalk, put them in a brown paper bag and share them with friends. We also like to make seedballs for ranch wildscaping and guerilla gardening projects. The recipe is easy, inexpensive, and makes for a great group activity. Looking back over the year, can you believe how much life–and fun–can be culled from a small butterfly garden? A modest patch of earth populated with appropriate, native and well-adapted plants beats a vast green lawn anytime. Good article showing the progression of the plants over the season and what butterflies are attracted to them and why. Excellent example of using a small space for prolific production. Thanks for the insertion of the details about seedballs and Monarch tagging. I love guerilla gardening! Me, too! Thanks for writing, and reading. We in the northeastern part of Texas are trying to plant for the butterflies too. Cowpen Daisy and Maximillium Sunflower are usually used here as well. We are working hard on getting the native milkweeds more established in our gardens or properties plus have some of the tropicals as well. They seem to survive our cold winters fairly well. You have shown how you can take a small space and make it a buffet for the butterflies and bees, just to mention two insects. Good job it looks great! Pam, have you tried Frostweed? It’s another amazing plant that should work for you. It’s a huge nectar plant for Monarchs in the fall–a native perennial that blooms big and white. Check it out! Good luck and thanks for the kind words. Please check in with us and report your progress. Holy Moly, what a an amazing year! And what a great in-depth and inspiring post! Keep it up, you are doing us all a great service. Wow, Monika, that was a very inspiring post! Cowpen Daisy–so under appreciated. Some people think the leaves have an unpleasant smell. I don’t think so. LOVE this plant. Thanks for writing, and reading.